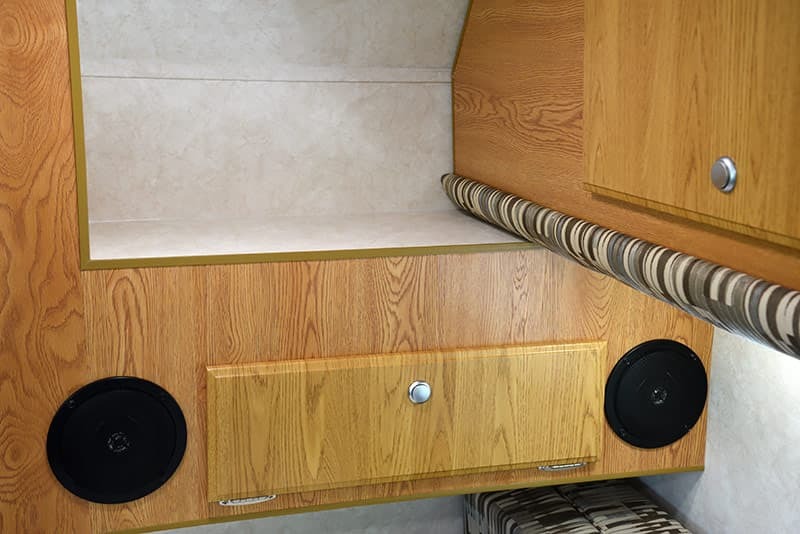 What else is inside this forward floor cabinet? 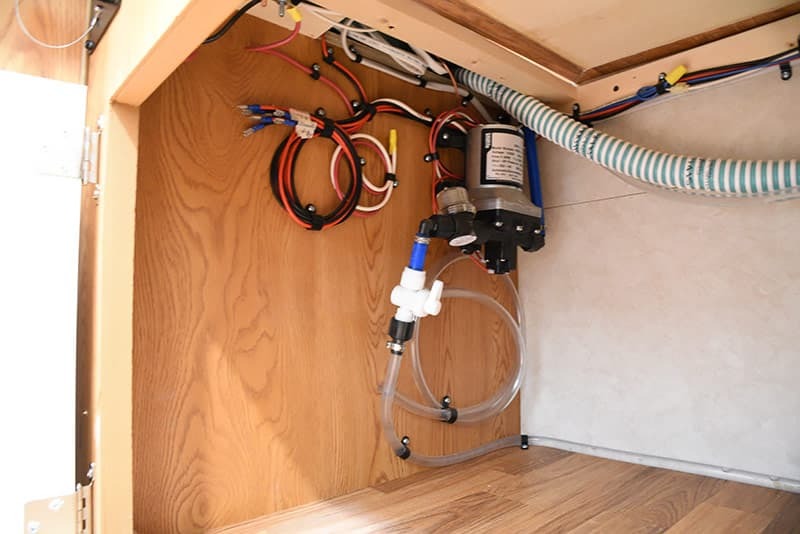 Easy access to the water pump! For anyone who has ever needed to access their water pump for service (including us) this is absolutely beautiful. 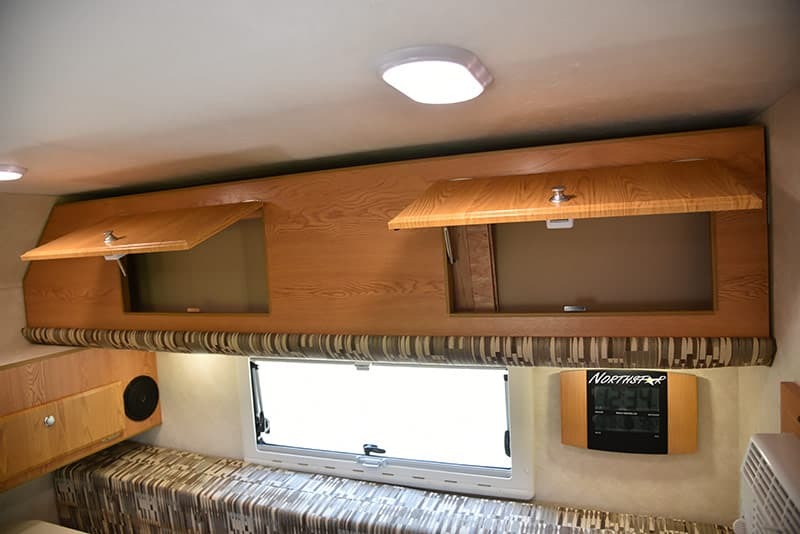 The passenger’s side front wall of the Vista features the notch where the optional drop down upper bunk rests, the optional stereo speakers are installed, and a storage cabinet. In its closed position, the optional drop down upper bunk offers a considerable amount of storage via two cabinet doors. Unfortunately, the upper bunk storage is somewhat compromised by the cushions and support boards needed to make the bunk into a proper bed. Given the size of the Vista, it’s likely that the unit will mostly be purchased by individuals and couples who will use the lower dinette as a bed. 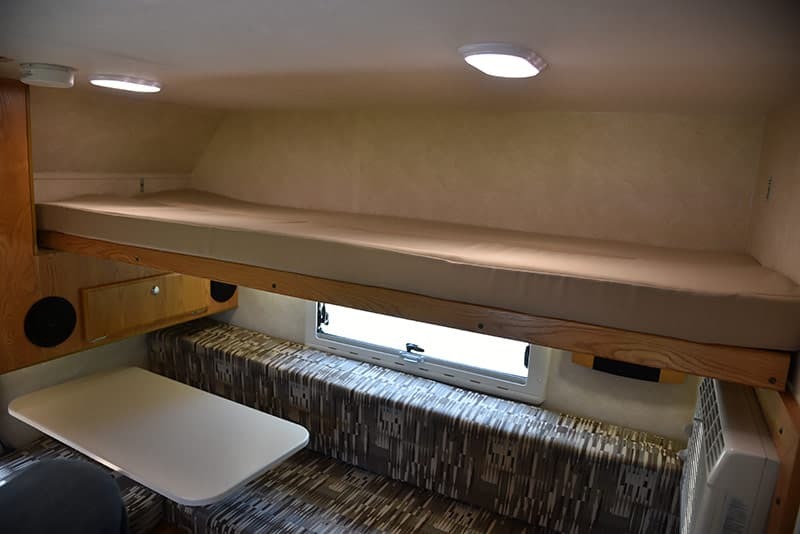 As such, the upper bunk will probably be utilized as storage with the upper bunk cushions and support boards left at home. 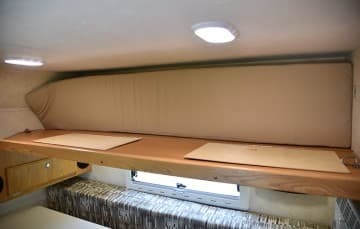 Making the upper bunk into a bed reveals one of the most intricate camper elements we’ve seen in some time. 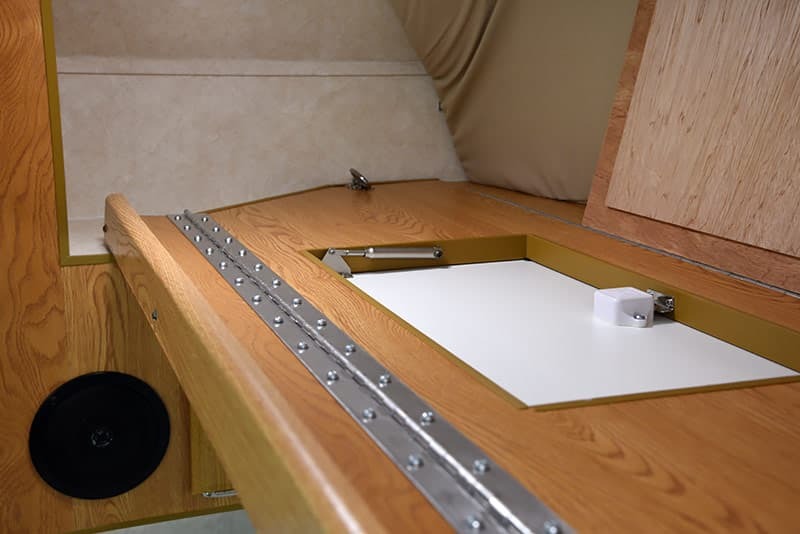 First, you release the upper bunk by opening the cabinet doors and reaching inside the bunk to pull the latches at the front and rear wall. 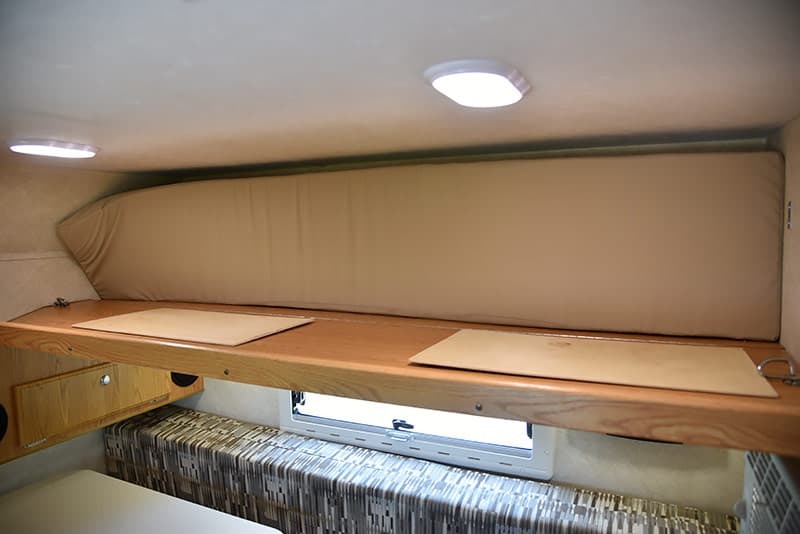 Then you lower the bunk into the aforementioned front wall notch and a rear wall support. Following that, a second fold via a piano-style hinge creates the final width of the bunk bed. 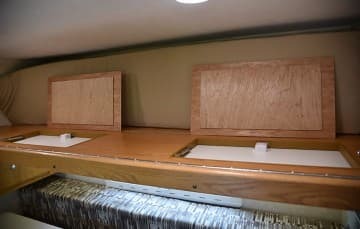 Once this is completed, the support boards are placed over the cabinet door spaces and the bunk cushions are brought into position. Reaching the bunk latches inside the cabinet to release and reattach the bunk takes a bit of getting used to, but is then relatively easy. Placing the support boards takes a second, but the bunk mattress cushions took some coaxing to lie flat. If you intend to routinely use the upper bunk as a bed, I suggest going through this process prior to purchase. 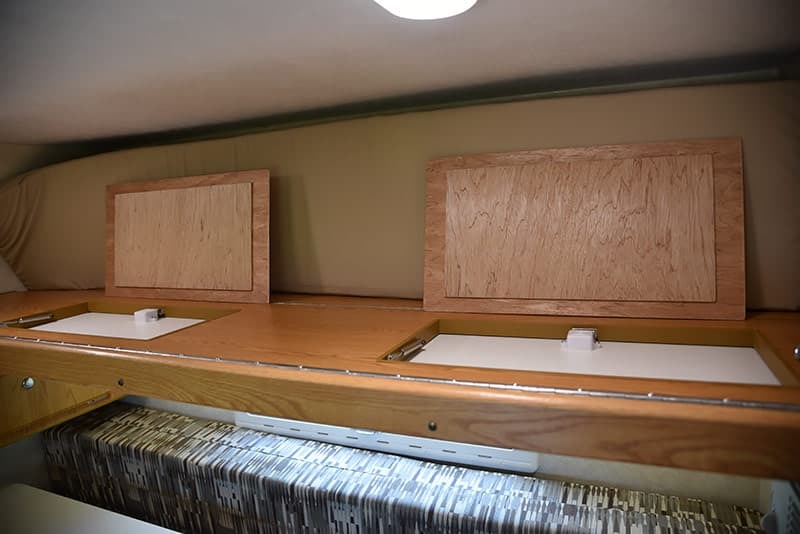 I was impressed with the intricacy and clever thinking that went into the upper bunk and would be happy to have its versatility on hand. 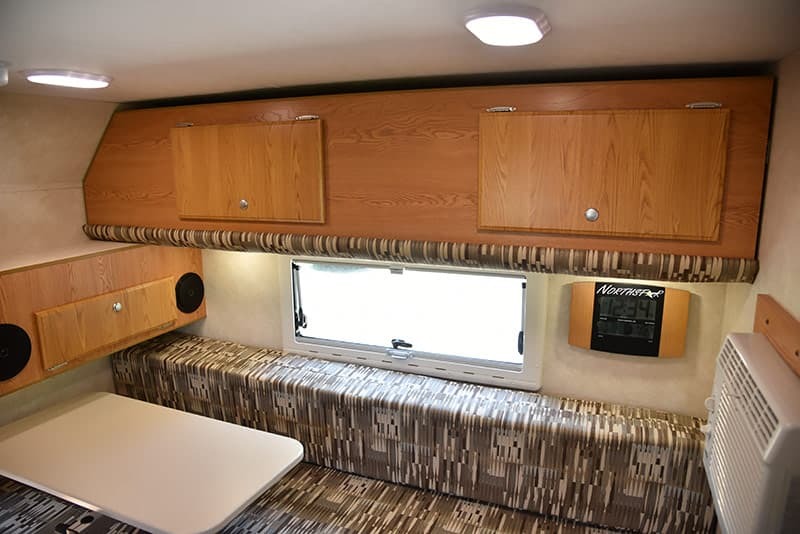 That said, we would use this space for storage, leave the support boards and cushions at home, and sleep in the lower dinette. Speaking of the lower dinette, that was another interesting first-time process. 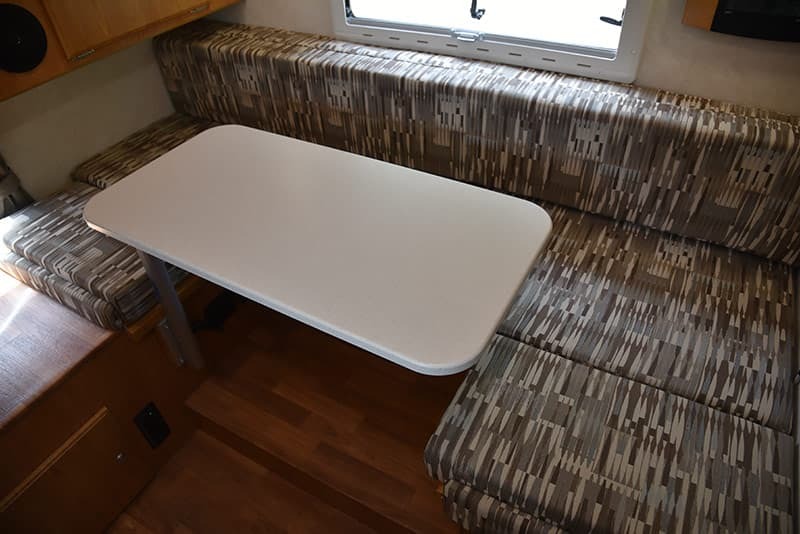 Having been left to my own devices (always a dangerous proposition) I initially failed to see how the lower dinette bed was assembled. After talking to myself for a considerable length of time, I figured out that the Lagun table leg must be removed from its mount allowing the table top to be placed as the center bed support. 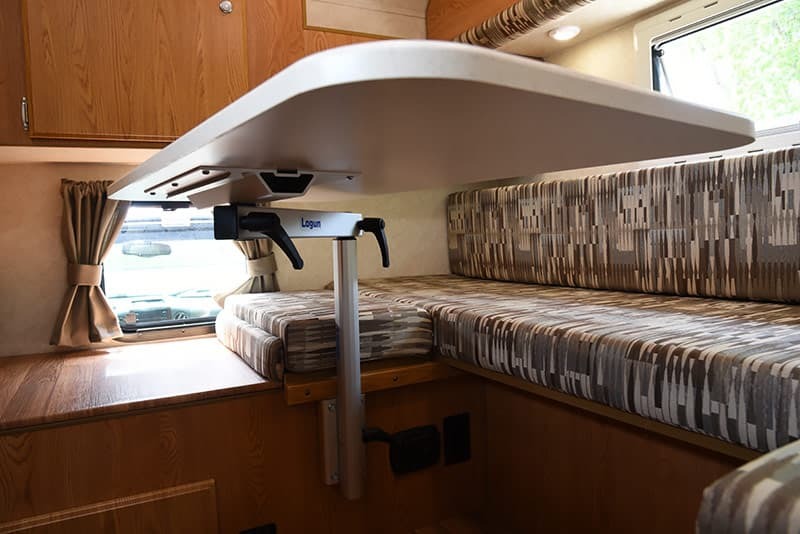 By typical RV table leg standards, the aluminum extruded Lagun table leg is a modern work of art and a real pleasure to use once you understand its unique loosening and tightening mechanisms. Hint: gently pull the handles and turn – righty-tighty and lefty-loosey!